TheArmenianKitchen.com : Spice up the holidays! The people in the test kitchen at POM Wonderful have been busy coming up with tasty recipes using pomegranate juice. 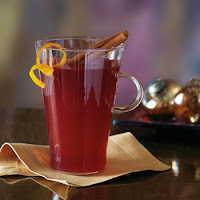 In fact, they created a dandy beverage just in time for the holidays called “Spiced POM Cider." 1. Combine all ingredients in a medium pot and bring to a slow simmer over low heat. 2. Keep heat low and simmer for an additional 45 minutes, then turn off the heat. 3. Allow mixture to steep for at least 2 hours off the heat. 5. Serve hot or cold; garnish with an orange slice. 6. For an alcoholic beverage, add 1 oz. apple brandy and ½ oz. Cointreau per serving. We're making ours with Armenian brandy, of course! For more of their recipes, visit http://www.pomwonderful.com/. What if I make it for you? Eating well means eating "gud"
Christmas is Armenian cookie time!